"Any business not thinking about integrated reporting needs to know that their competitors probably are. This is a commercial as well as a sustainability fact of life." "One Report has the potential to significantly change how investors think about value. The models we use to predict the future value of our investments are changing as analysts discover new factors that make significant contributions to a company′s ′upside′ as well as its ′downside.′ Companies that use an integrated reporting approach benefit by being better managed and also give notice of their intention to recognize an enhanced array of relationships that lead to better performance. Financial fiduciaries and long–term investors should celebrate the ideas put forth in this comprehensive, well–researched, and engaging book." "The Brazilian stock exchange, BM&FBOVESPA, welcomes the idea of a ′One Report,′ as proposed in this book, in which companies reaffirm every year in just one document their commitment to governance, civic awareness, and sustainability. The number of Brazilian companies that do this, like Natura, continues to grow. A company′s communication is just as important as its corporate strategy. After all, it is through communication that companies develop a permanent dialogue with their stakeholders." "Ensuring that responsibility for the impact of a company′s products and services on society as a whole is firmly embedded in a company′s core business is increasingly accepted. This book makes a powerful case for the logical next step that such reporting should be integrated with normal corporate financial reporting. It also discusses, with examples, ways in which the use of technology can make integrated reporting both less cumbersome and more comprehensive than before." "When I was a Commissioner at the Securities and Exchange Commission, I headed a task force of international regulators to study whether financial statements (designed for nineteenth century companies) could be made more relevant to the needs of today. The task force would have benefited greatly from the recent efforts of two thoughtful authors to improve financial reporting. Eccles and Krzus propose a principles–based ′comply or explain why not′ approach to have integrated reporting adopted as the model for financial statements. This sensible and flexible approach is an idea worthy of serious consideration in the U.S. and the rest of the globe." "As evident and straightforward as it may sound in terms of providing stakeholders and the company with the benefits of an informative overview of and entry into a company′s reporting of financial and non financial issues, it is quite a journey to get to ′One Report.′ But it is the only way. Eccles and Krzus′s book is an inspirational and practical guide on how to get there." Chapter 1 What Is One Report? The Meaning of One Report. Novo Nordisk: An Early Adopter of One Report. Rhetoric and Design in Natura′s 2008 Annual Report. The Urgent Need for One Report. Chapter 2 United Technologies Corporation′s First Integrated Report. A Brief History of Corporate Reporting at UTC. More on the 2008 Report. UTC′s Half–Century of Corporate Reporting. Chapter 3 The State of Financial Reporting Today. Chapter 4 The State of Nonfinancial Reporting Today. A Typology of Nonfinancial Information. Environmental, Social and Governance Metrics. Chapter 5 Sustainable Strategies for a Sustainable Society. Sustainable Strategies Require Integrated Reporting. Chapter 6 It′s Time for One Report. The Case for One Report. 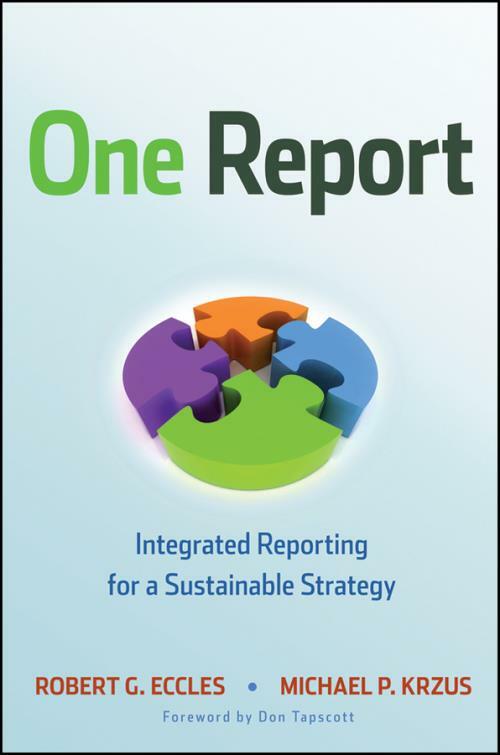 One Report for a Sustainable Strategy for a Sustainable Society. Chapter 7 The Internet and Integrated Reporting. A Web–based Perspective on One Report. The Essential Elements of Web–based Integrated Reporting. Web 3.0 and Integrated Reporting. Chapter 8 Integrated Reporting for a Sustainable Society. Support from the Investment Community. Appendix A: Companies and Organizations with URLs.